Art, technology and language shaped along 3,000 years come together under one roof. The British Museum has become the platform to display the artefacts from one of the most significant and universal history-defining civilisations on Earth: the Chinese. The Joseph E. Hotung Gallery of Oriental Antiquities – level 1, room 95, 33, 33c, 1b - immerses the visitor in a series of millenarian beliefs plus themes of play and performance in all their mystical glory. Every artefact in display is highly impregnated by deep meaning and influenced by the Buddhist beliefs. Respect for deceased ancestors is latent in the Chinese culture, which became apparent in Disney´s movie "Mulan" - based on a national legend. In the exhibition, there was a bell on display that is used to wake up people in hell, essentially suffering ancestors; however, this is an artefact to be used carefully by someone bestowed with that power. The Tibetan culture shows high respect for masters. In the display room, there is an amulet box to carry inside something from that person´s master -his fingernail, hair or picture. They use the amulet when they go on a journey for protection and positive energy. In the centre of the room lies a statue of a couple whose bodies are intertwined together in an expressive way bursting strength and emotion. Far from other cultures' artistic expressions, the figures are conceived as a prayer for the couple´s souls to be at a higher level. 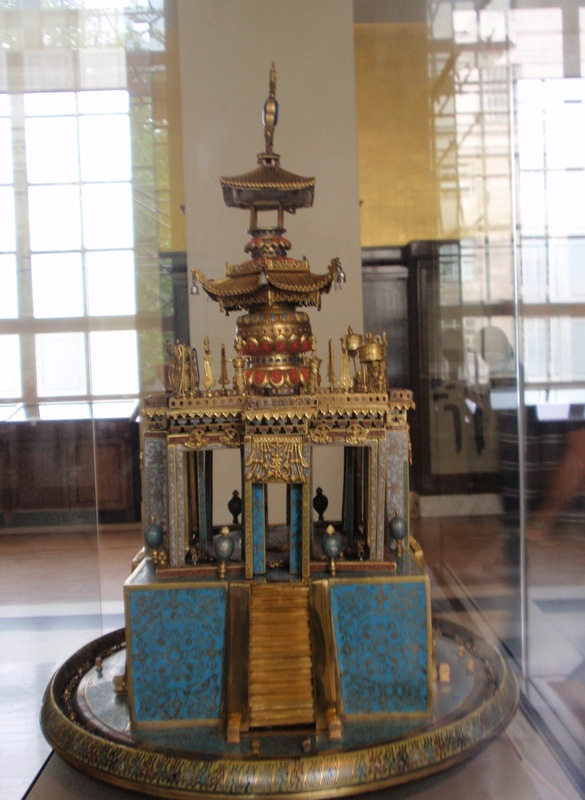 Following the centre of the aisle, there is a three-dimensional Buddhist mandala with coral, silver and jade. Legend tells that if you look from the top of the castle, you are not going to Hell -which brings to mind how many people have attempted that exactly. In the end of the aisle, in a collateral wall, the exhibition is crowned by a magnificent wall painting from Ron Qingliang (Pure Coolness) Temple, founded in AD 1183. 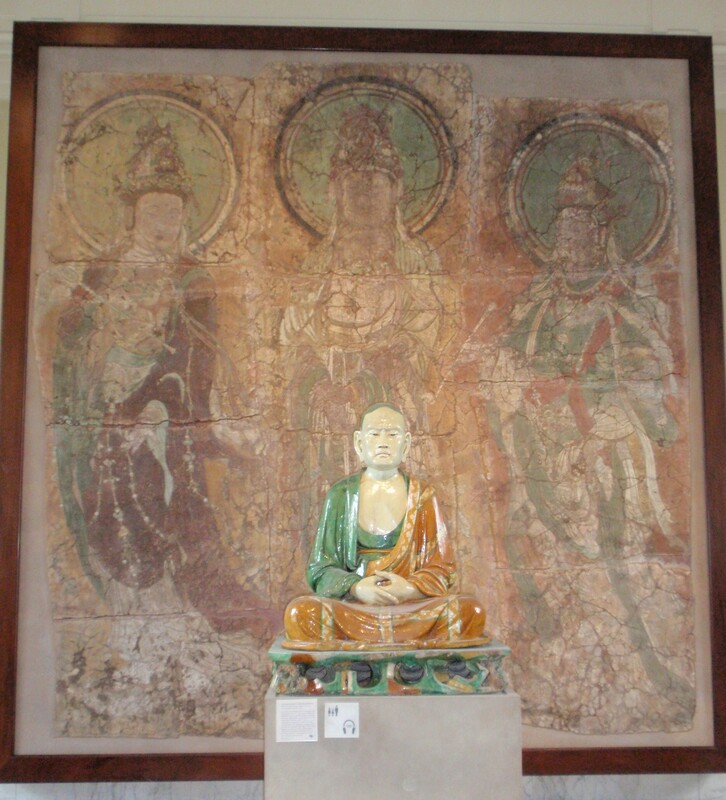 According to the description, the painting was executed by monks from a temple of Wutai Shan in the 15th century. The subsequent room salutes the jade as the most precious material for the Chinese, revered by them since the Neolithic times. Starting from that period, 7000 years of jade carving are accounted for in this comprehensive exhibition. Associated with power and wealth, carvings in jade come in all shapes and sizes, charged with all sorts of meanings. In the exhibition, you can find small jade animals the Chinese place at home for a myriad of purposes: the frog is for money while the mythical beast is for protection. Myth comes to life in this figure, as this beast is one of the 9 sons of the Dragon. Indeed, a must-see enthralling exhibition that travels through millenarian time and a remote place.